UPDATED – VATICAN CITY (CNS) — Pope Francis urged Syrian President Bashar Assad to do everything possible to end the war in his country, to protect civilians and to ensure humanitarian agencies can deliver emergency aid to the people. 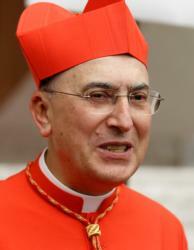 Syria’s SANA news agency reported Assad met Dec. 12 with new Cardinal Mario Zenari, the papal nuncio to Syria, and that the cardinal delivered a letter from the pope. After reciting the Angelus prayer Dec. 11 with people in St. Peter’s Square, the pope said that he is close in prayer to the people of the besieged city of Aleppo, Syria. Maronite Archbishop Joseph Tobji of Aleppo told Catholic News Service by phone Dec. 13 that the Syrian army had liberated most of the city from ISIS the previous day. He said the Syrian army called for the terrorists to surrender and come forward without their weapons. “Unfortunately, there was no surrendering,” Archbishop Tobji said, adding that Aleppo is still 1 percent or 2 percent under control of the Islamic State. Yet, because the city is nearly completely under Syrian army control, “the people are celebrating,” the archbishop said. Like a parade, “there were car convoys, people marching everywhere, expressing their joy,” he said. “Now that we’re looking toward the future, we’re hoping that the wishes of the Syrian people will be taken into consideration,” he said.